Belgium has a long history of Antarctic exploration and scientific activities, dating back to the first expeditions to Antarctica under the lead of Adrien de Gerlache in 1897. At the occasion of the International Polar Year 2007, the Belgian government decided to build a new scientific summer station in Antarctica. 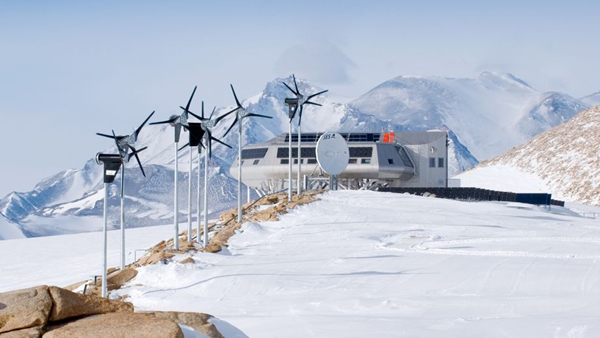 The new Antarctic base Princess Elisabeth was built during the Antarctic summers 2007/2008 and 2008/2009 and the first scientific activities started in January 2009. The station is situated north of the Sor Rondane Mountains in Dronning Maud Land, East Antarctica, on the small, granite Utsteinen ridge (71°57’ S, 23°20’ E, 1390 above sea level). 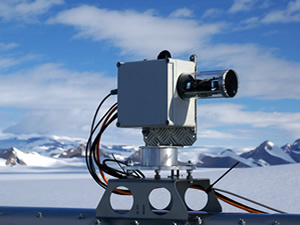 BIRA-IASB operates a CIMEL sunphotometer at the Princess Elisabeth station since February 2009. A MAXDOAS instrument has been installed in December 2015. It is of critical importance to better understand key atmospheric processes in the climate system, in order to improve climate models for reliable projections on the decadal scale. The role of clouds in the climate system, their interaction with radiation, the coupling between aerosols and clouds and the atmospheric branch of the hydrological cycle are recognized as key elements in the climate system. Although these research topics are high on the international research agenda, hardly anything is known about the interaction between clouds, precipitation and aerosols in the Antarctic. This is unfortunate, as the Antarctic and Greenland ice sheet are expected to become the dominant contributor to sea level rise in the 21st century. Since precipitation is the only source of mass to the ice sheets, and precipitation and clouds are closely connected, an improved insight in these processes is essential. Only models that can represent clouds and precipitation correctly, can be trusted to give reliable future climate projections. It is essential that the measured boundary-layer aerosol can be linked to higher atmospheric levels. To this aim, BIRA-IASB participates in the AEROCLOUD project (funded by BELSPO, started in January 2015 for a period of four years) with the installation of a MAX-DOAS instrument at the station at the end of 2015, for operation during at least two successive seasons. MAX-DOAS is a recently developed remote sensing technique for the automated monitoring of tropospheric gases and aerosols. By scanning the scattered sun light in successive elevations close to the horizon and analysing the atmospheric absorption signal using the DOAS method, the aerosol extinction and the concentration of atmospheric gases can be derived in a few successive layers above the surface up to approximately 2-3 km altitude. The BIRA-IASB MAX-DOAS and the sunphotometer are highly complementary, since their synergistic use provides information on integrated and vertically resolved aerosol properties. 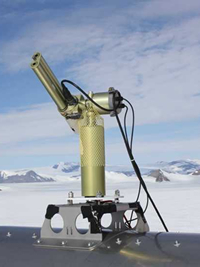 AEROCLOUD’s main objective is to improve the understanding and modelling of clouds, precipitation and their interaction with aerosols in Dronning Maud Land (East Antarctica). The project aims at improving insight in the so called « indirect aerosol effect », which refers to the role of aerosols to act as cloud condensation nuclei and ice nuclei, thereby affecting the characteristics of clouds. The objectives of AEROCLOUD can only be reached by a multidisciplinary research team, where expertise on observational studies of meteorological conditions (Royal Meteorological Institute of Belgium; RMI) is combined with expertise in regional climate modelling (Katholieke Universiteit Leuven, Belgium; KUL). Expert knowledge on radiative transfer processes in clouds (Institute for Geophysics and Meteorology Cologne, Germany; IGMK) and aerosols (Royal Belgian Institute for Space Aeronomy; BIRA-IASB) are necessary for developing algorithms to retrieve meteorological and atmospheric composition data from the suite of ground-based remote sensing instrumentation that will be exploited. First installed in February 2009, the Cimel is a passive radiometer, measuring direct sun and diffuse sky radiances (W/m-2) at 8 wavelengths (340, 380, 440, 500, 675, 870, 936, 1020 nm). The instrument needs clear sky in front of the sun for its measurements. The primary variables derived are the total column aerosol optical depth (AOD), a proxy for the aerosol loading of the atmosphere and the integrated precipitable water vapour (mm). Derived products include i.a. the aerosol fine mode fraction, Angstrom exponent (indicative of aerosol size), and single scattering albedo. The Cimel is part of AERONET, and the data can be found in its database ('Utsteinen'). The instrument has to be calibrated in Europe yearly, and travels therefore forth and back to Antarctica (in addition, no sun or too large zenith angle during winter). Data are available for the winter periods since 2009. In December 2015, a MAXDOAS system has been installed for atmospheric trace gases (NO2, O4, O3, ...) and aerosols profiles retrieval. The instrument, delivered by ENVIMES (contact : envimes@web.de) covers the UV (295 - 450 nm) and visible (430 - 565 nm) regions. The spectrometers (Avantes type) are temperature stabilized and humidity protected within a box indoor. The telescope will scan zenith and different elevation angles at fixed viewing azimuth. This advanced instrument allows automatic dark current, offset and calibration with mercury lamps measurements. AEROCLOUD is coordinated by the Catholic University of Leuven (Department of Earth and Environmental Sciences, Prof. Dr. Nicole Van Lipzig), in collaboration with partners Royal Meteorological Institute of Belgium and the Royal Belgian Institute for Space Aeronomy. AEROCLOUD is financed by the Belgian Science Policy Office (Belspo). AEROCLOUD started on 1 January 2015 for a duration of 4 years.